Your vehicle locked and secure automatically at all times, or at times chosen and set by yourself on any days you want. Simple. Battery backed up timer so it always remembers the time and settings even if the vehicle battery is disconnected for sustained periods. Make it yourself from off the shelf professionally made components, here’s mine. Reliable, dependable and only 3 wires to connect to your vehicle. it doesn’t get any simpler than that. 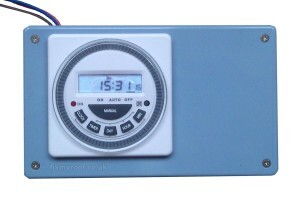 Installed in a tough plastic project box, the timer unit is pre-made and fully assembled and comes complete with a clip on Perspex cover to guard against accidentally knocking the buttons on the front. If you can solder to a very basic level or want to learn to solder to a basic level, it’s easy to follow my plans to make you own reliable automated Van or vehicle locker. Then simply connect the finished locking unit to your vehicles 12v Positive, a Negative and a Central locking point. Why use an automatic van locking unit? If you’re reading this you have probably either already had your tools stolen or almost had your tools stolen as I did one summer evening in 2010. Luckily my insomniac next door neighbour heard them at 3.30am and called the police who scared them off. Over £1000 pounds worth of power tools and cordless equipment saved. Just once, I had forgotten to lock my Van. These characters walk the streets every night testing door handles instead of working, if its not you it’s someone else. After thinking long and hard, I decided to search the internet for an automatic van locker, automatic car locker and an automatic central locking unit. Nothing. So I decided to build my own from off the shelf reliable tested components. I have now been using it for over two years and it works like it did when I first installed it, it’s been absolutely superb. I have also built one for a family friend who works as an employee for a local refrigeration company, who had his work van raided by thieves in January 2011. Its funny but people with remote key fobs these days do not always realise they may have left their van or car unlocked overnight. Now it’s never unlocked. I always lock my van, do I really need one? That’s what everyone says, In fact that’s what I would have said. I really couldn’t get my head around the fact my van wasn’t locked, eventually I had to admit I may have forgotten. Just once is all it takes. ‘But I live in a nice area’, yes so do I, in fact that probably increases your chance of being burgled. What happens if it locks you in ? Know your vehicle. There is no possible way to be locked into my van from the inside, all doors open and override any locking or deadlocking. Make sure your van or car is the same before considering fitting. I also set mine to lock twice at times I know I am very unlikely to be in the vehicle, in my case 9pm and 11pm. Why more than one locking event in a day? You may go out in the evening outside of your normal routine, the second locking event is insurance against forgetting to lock the van after the first automated lock. A change in routine makes you more likely to forget. Set up to 8 locking events in any 24 hours. Why not just have it auto lock as you leave the vehicle? 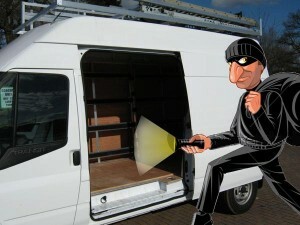 Two reasons, firstly if you go back and fourth a lot during your working day to fetch tools and kit it can become a nuisance to constantly unlock you van, especially if you are working within eyesight of your van. Secondly this does increase the chances of you keys being accidentally automatically locked into the vehicle. What if your keys are automatically locked in? Make sure you have a spare set of keys. Also I would recommend setting the auto locker at times when you know the vehicle will be parked up and not in use. How do I find my central locking point? Without leaving your armchair, either search forums, or purchase your vehicles technical manual or handbook on CD or DVD from eBay or ask a car alarm or car radio fitter. For the price of a drink they are usually more than willing to help, you could also ask them to fit it for you if you like.